New council housing on Thorpe Crescent, Oxhey. 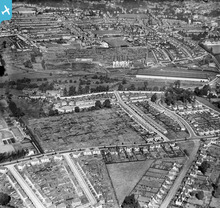 Private housing on Woodwaye, laid out in 1925. Refuse Destructor chimney, demolished in 1947. Carriage sheds built for the London & North-Western Railway in 1914/15, alongside the Croxley Green Curve. They were finally demolished in 1987 after more than 70 years of stabling rail stock and carrying out minor maintenance for the LNWR 1915-23, London, Midland & Scottish Railway 1923-1948 and British Rail 1948-1987. Watford FC's ground in Vicarage Road. Watford Union Workhouse, renamed Shrodells Hospital in early 1930s and now Watford General Hospital. 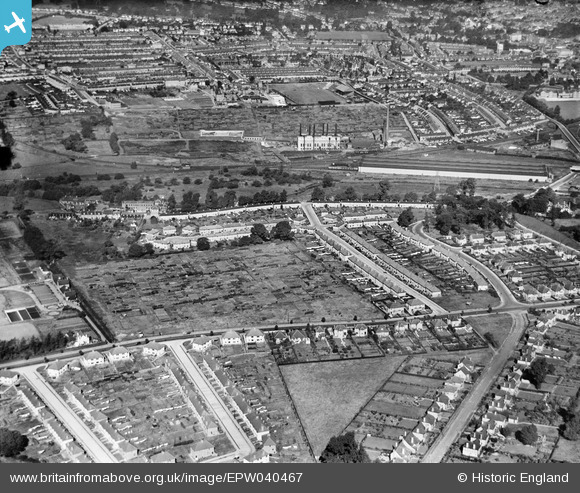 This is a view looking in almost the opposite direction to a previous image featuring Vicarage Road and environs, and so is worth inclusion in this collection of photographs taken around the south side of the town over 80 years ago.